The tax credit phases out when an automaker sells 200,000 EVs. None has. WASHINGTON -- A dozen states on the Eastern Seaboard, from Maine to Virginia, plus the District of Columbia, have signed on to a strategy for building electric vehicle charging infrastructure to make fuel access easier and encourage people to buy EVs. The multistate vision looks at different charging-use cases -- home, work, around town, highway and destinations -- and identifies priorities and key roles for investors in each one. Creating a regional strategy in the Northeast was important because "It's a unique area where people work and live in different states, or have family nearby, and people are frequently traveling through states on a daily or weekly basis," Elaine Grady, senior policy adviser for Northeast States for Coordinated Air Use Management, which facilitated the multistate effort, told Automotive News. "It's not enough for states to say they are going to have charging networks near where they live. They have to coordinate with other states so there's a consistent and convenient charging network throughout the region because of the geographic proximity and small size of states on the East Coast." EV demand is increasing, but it remains a fraction of the new-vehicle market. Sales of low-emission vehicles, including hybrids, accounted for 3.2 percent of new-vehicle sales in 2017, or just over 560,000 vehicles, up 12 percent from 2015, according to data provided by car-shopping platform Edmunds. Over the same period, partial and full-electric EVs gained 0.4 of a percentage point in market share. Utility actions to lower the cost of charging at home, especially at multi-unit dwellings where high upfront installation costs can be a barrier. State incentives and outreach to promote workplace charging and locating charging hubs at strategic locations around town, such as airports, train stations and other popular sites. 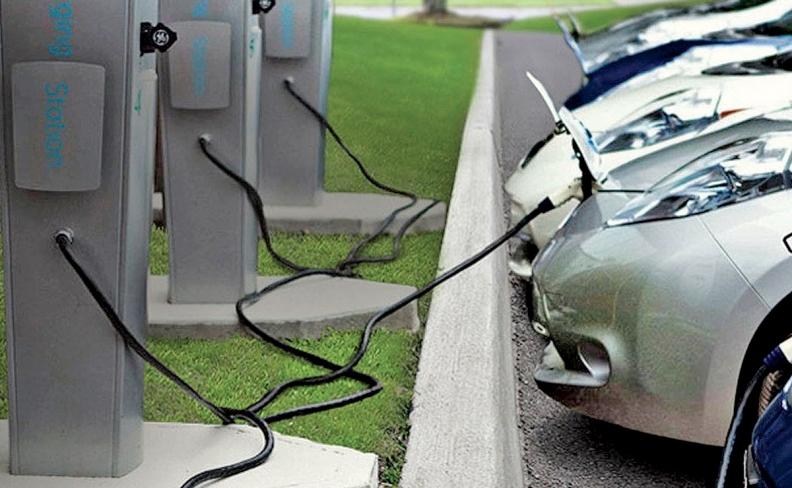 Expanding DC fast-charging stations along heavily traveled highway corridors. Increasing charging at key destinations such as beaches, mountain resorts, state parks and historic sites so people have confidence they can go anywhere with an EV and not be stranded without power. "Electric vehicles are an increasingly significant component of the vehicle mix in New Hampshire. This strategy will inform the development of a New Hampshire-specific charging infrastructure plan and help ensure EVs are able to travel around New Hampshire and throughout the Northeast corridor," said Robert Scott, commissioner of the state's Department of Environmental Services, in a statement. Seven weeks ago, a coalition of Northeast states and 16 automakers launched "Drive Change. Drive Electric," an education campaign designed to grow consumer awareness about the dozens of plug-in hybrid and battery-electric vehicles available today, incentive programs that make them more affordable, and their operational benefits. The Northeast States' group is managing that effort, too. Northeast and mid-Atlantic states already are making investments in charging infrastructure and offering a range of policies and programs, such as tax credits, to encourage driving electric. Last week, New York Gov. Andrew Cuomo announced a $4.2 million plan to install more high-speed EV charging stations along the New York State Thruway, enabling EV owners to drive the length of the state without having to exit to recharge. The New York State Thruway Authority is partnering with the New York Power Authority to install the charging stations at Thruway service areas and commuter parking lots over the next two years. The state's goal is to install 10,000 charging stations by 2021 and have zero-emission vehicle sales reach 800,000 by 2025. States from Maine to Virginia also have access to up to $108 million from the $2 billion fund Volkswagen created to settle federal claims it violated the Clean Air Act by cheating on diesel emissions. The money can be invested in charging and hydrogen fueling infrastructure. In addition, utilities in Delaware, D.C., Maryland, New Jersey, New York and Rhode Island have proposals approved or pending, representing an investment of about $200 million for charging infrastructure and other actions to increase the use of electric cars. Private-sector fuel providers complained to Congress last week that EV infrastructure is being unfairly subsidized and that public utilities should not be allowed to invest in charging facilities because their cost of capital is covered by rate payers. The expansion of charging infrastructure is the type of effort sought by automakers, who say states with mandates for sales of ZEVs need to do more to help make those targets a reality.